Assisted Living or Memory Care? Around 70 percent of adults over the age of 65 will need help with activities of daily living care at some point in their lives, according to the U.S. Department of Health and Human Services. When we recognize that either we or our family members may need extra help with the things we once managed on our own, we often begin to think about senior living. 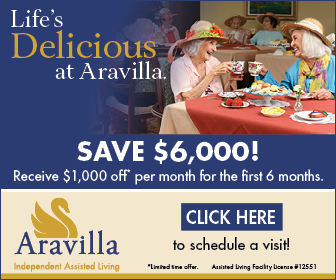 Two of the fastest-growing types of senior living communities are assisted living and memory care, both available at Aravilla. Although assisted living communities may have memory care on the premises, the two types of care are not synonymous. What are the differences between the two, and which one is right for you or your loved one? Assisted living may be a good choice if you are still active and can live autonomously, but want the peace of mind that comes with the availability of help when you need it. Assisted living communities vary widely in cost, residence styles and services, which is why Aravilla recreated assisted living to make it customizable and personal. We offer a variety of private apartment plans that allow you to maintain your privacy and freedom. Like other assisted living communities, we also provide a variety of optional personal care services and aid with the activities of daily living. You can select the services you want and need, but maintain independence in other aspects of your life. Assisted living facilities are not federally regulated, but they should be licensed by the state in which they are located. For additional information on assisted living, the Assisted Living Federation of America offers a convenient downloadable guide: download it here. Memory care caters specifically to people with Alzheimer’s disease, dementia and other types of memory problems. Sometimes called special care units (SCUs), memory care communities usually include 24-hour supervised care within a secure area of a residential community. In addition to providing assistance with activities of daily living, as you would expect in assisted living, the staff in memory care communities should be specially trained to assist residents with dementia or impaired cognition. In addition, the physical layout and security of memory care communities should be designed to prevent wandering behavior and make navigation pleasant and easy. This is clearly evident at Aravilla Memory Care, which incorporates dozens of features to accommodate the special needs of our residents. In addition to the general state-level licensing of assisted living, memory care is further regulated in 23 states by special care unit disclosure laws requiring care providers to disclose the special services they offer. However, because these laws are not yet universal, it is critical for caregivers to research facilities well before making a decision. Contact us to receive more information. Request more information and a tour today!